Our chat covers her embodiment of that diversity through her love for her abuela's orange cake, learning to love Indian cuisine from her Indian American husbands perspective, eating a world of food with her family, and where the best mole sauce comes from in “Mas Dosas”, Episode 52 of the Something About Food? Podcast. 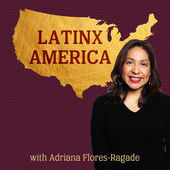 Adriana Flores-Ragade is the host and producer of LatinxAmerica, a podcast focused on increasing diversity in tech through storytelling. She has extensive experience in non-profits, education and media having worked at the Red Cross, the College Board and most recently at Univision Communications, Inc. In her spare time, she enjoys traveling the world with her family. If you’ve never had a dosa you won’t realize that it is the crepe in the left of this picture and that, although it doesn’t look it here, it is gargantuan!